Joanne Thomas is a superstar French teacher from Atlanta, Georgia that I met on Twitter 3 years ago. A couple of weeks ago, I convinced her to join the "Mystery Hangouts for Foreign Language Teachers" Google+ community and to do a Practice Mystery Hangout with us, which I have been hosting every Monday night (8pm, EST). Well, after the Hangout, she suggested that we try a different game with our students. Where she came up with this, I have no idea, but the moment I heard it, I knew that it would be brilliant. In a nutshell, instead of playing "Mystery Location", we would play a game of "Guess Who?". 1. Each student creates a profile of him/herself. Click here for one of my student's. Click here for one of Joanne's. Note that it does not matter if the profile outlines are different. 2. Teachers email all students' profiles to each other and print them out. The following steps are flexible. Joanne's were slightly different from mine. 3. Students get into groups. 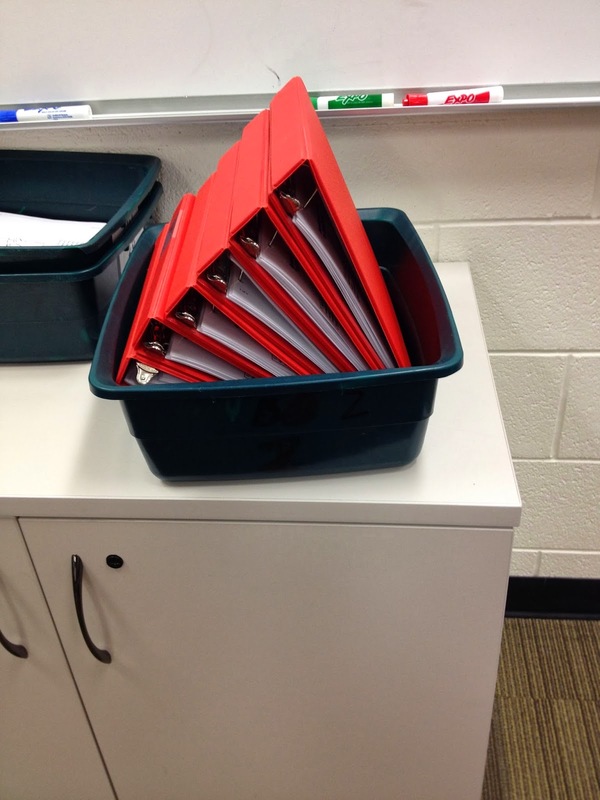 Teacher distributes profiles of the other class to each group, handing out 2-3 profiles/student. 4. Teacher practices game with students. She has a copy of all of the profiles of the other class. She chooses one and pretends to be that student. Her students ask her questions, trying to guess who she is. For example: "Est-ce que tu es une fille?" (Yes/No answers only). Teacher answers "Oui, je suis une fille" or "Non, je ne suis pas une fille". Click here for a wonderful document that Joanne put together to help my students with questions for her class. 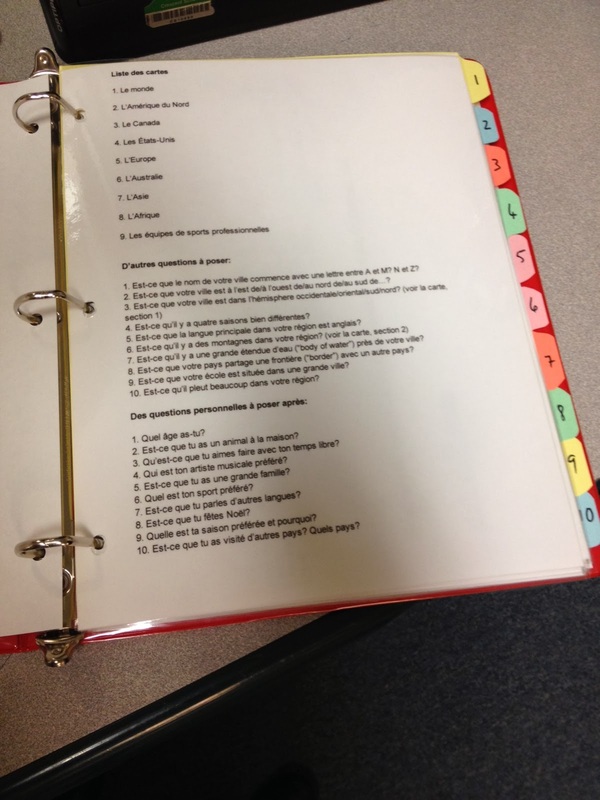 Click here for the document that she made to help her students with questions for my class. This can be photocopied and handed out to the students (note that the questions are different in each class because the profiles are different). 5. Students turn over all of the profiles of girls (or whatever the case may be). 6. This questioning continues with students turning over profiles as they are eliminated one by one, until someone tries to guess: "Est-ce que tu t'appelles....?" 7. Teacher: "Oui, je m'appelle...." or "Non, je ne m'appelle pas....". Game continues until identity is discovered. 8. Teacher continues game choosing a different profile (or a student can choose a profile and pretend to be the student) until all profiles are guessed or until class time runs out. Teachers explain that it will be a game to see which class can guess the most number of students in the least amount of time. Game will be played in rounds and a timer will be used. Students wear disguises in class (hats, wigs, sunglasses, etc.). One student will be picked by the teacher to be the first "Personne Mystère". He/she goes in front of the camera. Students from other class start to ask him/her questions. "Personne Mystère" must answer in full sentences. When the student's identify is discovered, the timer stops and the time is recorded for Round 1. Now the other class puts a "Personne Mystère" in front of the camera and the other class tries to guess their identity. Time is recorded and a winner is declared for Round 1. Continue playing as long as time permits. Brainstorm with your students and the other teacher how you can improve the activity for next time. For example, Joanne and I were very pleased with the Hangout overall, but remarked that the students were slow to get to the camera to ask their questions and this dragged down the activity significantly. I think that with more experience playing "Qui est-ce" and Hangouts, our students will get better and faster with the questions. However, Joanne has some ideas on how to improve the activity which we will try out and I will blog about at a later date. Last weekend I attended a typically mind-blowing GAFE Summit in Montreal, where I was fortunate to attend a session by EdTechDiva Holly Clark called "Get connected: your students and the world". One of the things she talked enthusiastically about was live video-conferencing in a format called "Mystery Skype/Hangout". This is a topic that has been quite popular on educators' social media sites recently. It is high time for me to try it out! In short, a Mystery Skype/Hangout is a real-time, live game played with two groups of students from different locations. Students take turns asking questions to the other class to determine their location (Yes/No answers only). The goal is to guess the other classes' location before they guess yours. Any video conferencing tool will do but Skype and Google Hangouts are the most popular (Click here to see the Mystery Skype community). Since I am new to Mystery Video conferencing, I delved into researching it first. I found many wonderful sites explaining how it works, with lots of video examples to view. There are a couple of great Google+ Communities to connect with other interested teachers for a Mystery Hangout. However, I noticed that this trend has not seemed to have hit the Foreign Language teaching community yet (although many teachers in the French Immersion community have been doing Skype Mystère). I therefore created a Google+ Community for Mystery Hangouts for Foreign Language Teachers and now my hunt for classes to "Hangout with" is on! 1. A laminated list of suggested questions on a question schema so that everyone understands the flow of questions and how to eliminate locations. 2. 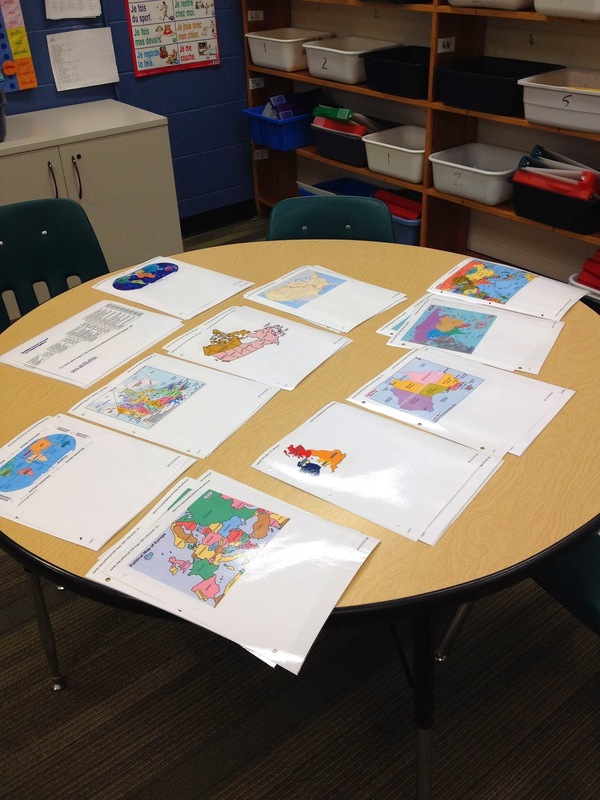 Binders with maps. Click here for a list of maps I have photocopied and laminated. Click here for the first page in the binders. 3. A dry erase marker to follow the question schema and to cross out eliminated areas of the maps. 4. A laptop for more research. Each group will choose a representative to ask one question. We will just go from group to group getting a question from each group to the end of the game. Afterwards, if there is time, we will ask more open-ended questions to learn more about our each other and our communities. Do you have experience with Mystery video-conferences, or would you like to participate in one? Please see the links to the right to get more information and to connect with other teachers with similar teaching areas. Or just leave a comment below! Click here for original (Go to "File > Make a copy" to make your own editable version. 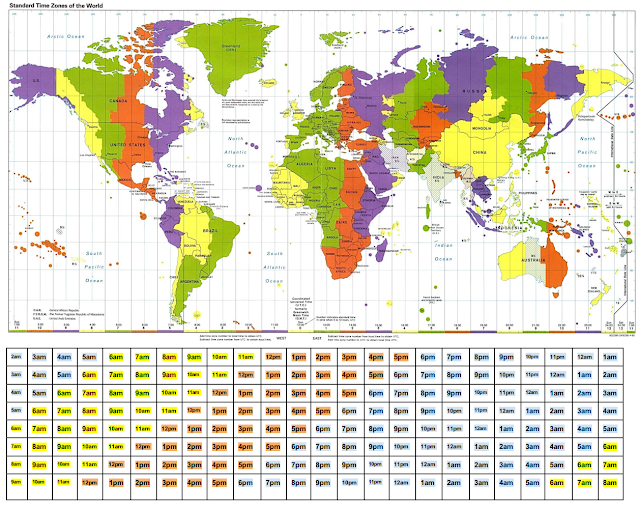 Click here for instructions on how to customize your own time zone map to go with your school.